- Participation in overseas internationaal tenders. - Incentives for the storage, treatment and disposal of toxic and hazardous Waste. • Pioneer status : will enjoy a 100% tax exemption on their statutory income during their 5 year exemption period. • Investment Tax Allowances : will enjoy an allowance of 100% on the qualifying capital expenditure incurred within a period of five years. • Investment tax allowances : 100% on qualifying capital expenditure incurred within 5 years. Allowance can be used to setoff against 100% of the statutory income in each year of assessment. The POIC at Lahad Datu will be developed in two phases. 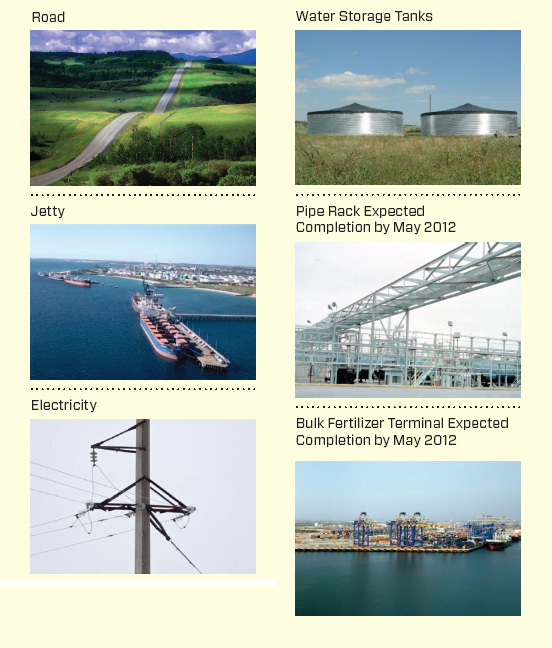 Phase 1, due for commissioning in 2006, covers 500 acres meant for bulking and oil-based industries. Phase 2, covering 500 acres for oil palm biomass and food based industries will start development in 2007. Apart from being developed for the growth of a wide range of palm oil downstream industries, the POIC in Lahad Datu will also serve as a centre where investment in upstream activities will flourish. SABAH forms one of the thirteen (13) states that make up Malaysia. It covers a land area of 73,997 sq km. Sabah. Rich natural resources (petroleum, gas, timber, minerals, fisheries), fertile land and a small population (2.5 million in 2000) make Sabah a land of plentiful investment opportunities. Strategically located in the heart of the BIMP-EAGA (Brunei, Indonesia, Malaysia, Philippines East Asean Growth Area). Sabah lies in the centre of one of Asia's largest regional grouping, spanning territories of four ASEAN countries measuring an estimated 1.54 million sq km and home to 60 million people. As the biggest producer of palm oil in Malaysia, the investment potentials in the sector are being given focused attention through the palm oil industrial cluster concept and the creation of the POIC Sabah Sdn. Bhd., the company to spearhead the realization of the concept as the State Government of Sabah seeks to further diversify its revenue base. Palm oil industrial clusters are also envisaged for the Sandakan and Kimanis areas where substantial oil palm plantations thrive. The creation of the clusters and the investments in oil palm-related industries are expected to strengthen Sabah's economic foundation and also Malaysia's position as the foremost producer of palm oil in the world. Malaysia is strategically located in the heart of Southeast Asia with a population of 24 million and a per capita GDP of RM14.500 (USD3,800). Kuala Lumpur is the capital of Malaysia and doubles as the financial and business capital with an estimated population of 1.8 million. Malaysia ranked among the world's top 20 trading nations and is one of the fastest growing economies in the world and also a leading exporter of manufactured goods. It is blessed with an abundance of natural endowments such as petroleum and natural gas, timber, minerals and marine resources. Malaysia is the world's largest producer and exporter of palm oil. This commodity is playing an increasingly important role in the country's revenue (RM20 billion in 2004) second only to petroleum (RM21 billion). Palm oil is produced primarily in South East Asia where Malaysia is the largest producer palm oil. The most traded vegetable oil in the world id Palm oil with soybean oil in second place. Malaysian Government plans to invest RM120 million in three joint-venture biodiesel plants, through the Malaysian Palm Oil Board (MPOB). The plants will produce 180,000 tones of biodiesel every year. The Malaysian Industrial Development Authority (MIDA) has approved nine biodiesel plant licenses, mostly in Peninsular Malaysia. The investors included those from Italy and Singapore. German train operator, Prignitzer Eisenbahn (PE) Arriva AG is working with MPOB on the use of oil palm biodiesel to run trains in Germany. About 35 tones of Malaysian palm biodiesel have been shipped to the German company. According to reports, the trial run in September 2005 had been promising and Prignitzer had ordered 100 tones more palm biodiesel from Malaysia. Malaysia is the largest producer of palm oil in the world. Palm oil is also cheaper as raw material for biodiesel and is the most abundantly produced vegetable oil in the world. Diesel and biodiesel are cheaper, providing 30% more mileage per liter compared with gasoline. Diesel and biodiesel cannot be replaced, based on current technologies, as many heavy-duty vehicles like trucks, buses and tractors require the “pulling power/ torque” to haul such heavy loads and petrol/ ethanol cannot provide such power as cheap as diesel/biodiesel. Ultra low sulphur diesels (ULSD) is more environmentally friendly than petrol and works better blended with biodiesel. Currently biodiesel and ULSD blend are the most favored fuel in Europe. Today, over 70% of new vehicles registered in Europe are diesel powered. The key to success in biodiesel industry is technology and quality. Malaysia has the first integrated biodiesel plant in the world able to produce biodiesel and phytonutrients from crude palm oil. Malaysian Government has announced it will accord the pioneer status or high technology status to biodiesel companies, which provides a 70% and 100% tax waiver for five years. To compete globally, Malaysian biodiesel need to produce high quality cost-competitive products. To have cost competitiveness a producer must achieve economies of scale in operations and this can only be achieved with a large market. Many markets like South Korea, the United States and European Union (EU) do not allow the use of direct vegetable oil into diesel engines. For instance, the EU standard on biodiesel (EN 14214) requires a minimum content of 96.5% methyl ester and no more than 0.2% triglycerides. As the leading producer of palm oil in the world, oil palm fiber is abundantly available in Malaysia. This Oil palm fiber is used in several different areas. Oil palm trunk fiber is light and absorb lot of water without congealing. It withstand extremes temperature and moisture conditions during food processing, and could have a wide range of applications in foods where fiber might added, such as yogurts, breads, pastries and other products using durum wheat. This is not only a commendable achievement by the POIC but is of great significance to Sabah. For the first time in Sabah’s history witness a large wave of foreign interest in developing Sabah’s downstream industry There is a rush of investor interest in the POIC. This is testimony to the business potential in the sector. We have raw materials for feedstock. We have an excellent harbor and we are located near southern Philippines and Indonesia’s Kalimantan which are sources of future oil. The nine companies, which have bought 140ha of the POIC land, include investors from Britain, Australia and South Korea. Based on plans at the POIC area and licenses granted by the Malaysia federal government, the companies were expected to inject RM1billion to produce close to one million tones of biodiesel by end-2008. Palm Oil Research Institute of Malaysia (PORIM). Scientific and managerial aspects contributing to the success of the crop include the significant genetic improvements and production of high quality planting materials, the development and application of finely-tuned agronomic practices, the appropriate scale and efficient organisation of oil palm plantations and the continuous Research and Devalopment and good infra-structural support provided in country. PORIM - Palm Oil Research Institute Malaysia (PORIM), established by law in 1979, is funded mainly from a research tax from palm oil millers, which brings in 70 million ringitts every year. The Malaysian Board of PORIM includes representatives from the palm oil industry and the government, is advised on the research programmes of the institute by a Programme Advisory Committee formed by experts in their own fields. The first oil palm plantation in Malaysia was set up in 1917. Since then the palm oil industry has grown to become the largest producer and exporter of palm oil in the world, accounting for 52 percent of world production and 64 percent of world exports in 1997. The Malaysian oil palm industry is sustaining its performance in 2003 after staging a significant recovery in 2002 despite a weak global economy. Palm oil & palm oil-based products is Malaysia's second Largest export revenue, with a total value of RM20.8 billion (US$5.47 billion) during the first nine months of 2003, accounting for 7.6 per cent of total exports of RM271.5 billion. Competitive price of palm oil, liberalization of export duties and the encouragement by Malaysian government contributed to the higher exports. The palm oil industry provides employment to about 350,000 workers in the plantations, land schemes and supporting industries and services. TAWAU: The comprehensive research on viable renewable energy, using oil palm biomass and palm oil mill effluent, currently being undertaken by the Malaysian Palm Oil Board, will be ready in a month, Plantation, Industries and Commodities Minister Tan Sri Bernard Dompok said. "The research is on-going. We will have the findings within a month. The research covers all aspects including economic viability, problems faced by parties involved and the actual number of oil palm mills which can geneate biomass-based energy. "I can truly say this is one industry which has a huge potential to generate 1,335 megawatts of energy if all the palm oil biomass produced in the country is maximised to the fullest," Dompok told reporters after officiating a conference of the East Malaysia Planters Association here on Monday. The conference themed, "Sustainable Growth For People, Planet and Profit" is organised by EMPA and sponsored by Sabah Softwoods Sdn Bhd. He said despite the industry's vast potential, exorbitant start-up cost and capital outlay could pose challenges. "One major issue to overcome will be the distant location of palm oil mills from Tenaga Nasional (TNB) and Sabah Electricity Sdn Bhd (SESB)'s transmission line grids. "Besides, the tariff offered by power purchasers in this country is 21 sen for per kw/hour, which is too low, while the industry needs to fetch between 29 sen and 30 sen for per kw/hour to remain profitable," Dompok added. He said MPOB's research would also address this problem and the findings would be handed over to the government for further action as the issue of palm oil biomass renewable energy also involved other ministeries. Dompok said palm oil mills nearer to TNB or SESB's transmission grid can take off first while mills located far away may take longer to take off. "It has to be carried out in stages. We might need two phases to implement the activities," said Dompok, adding that the use of palm oil biomass as reneweable energy can solve the government's problem of ensuring adequate electricity supply in the country and Sabah. "I wish to emphasise here that this is not the sole solution to the power supply problem in Sabah but it will complement the government's effort to overcome the shortage. "What's more important is we will be able to clear palm oil estates (of the empty fruit bunches), and give a clean image to the industry. Earlier, Dompok urged all 417 mills in the country to pursue the use of biomass and palm oil mill effluent in the production of renewal energy and organic fertiliser. He said the goverment had allocated RM1.5 billion under the Green Technology Fund which can be utilised by mills to produce bio-energy. KOTA KINABALU, March 10 (Bernama) 2010-- Sabah and Indonesia's Kalimantan provinces should be packaged as one investment destination, says State Industrial Development Minister Datuk Raymond Tan. Sabah and Kalimantan can work together to leverage on their prominence in world palm oil production, and a secretariat to handle enquiries has been proposed, he said. A statement released by the ministry here today said in order to make it happen, a joint secretariat would be desirable for government officials and business groups on both sides of the Borneo border to develop an investment data base, and encourage interaction and collaboration. It said the view was shared by Indonesian Consul-General in Sabah, Soepeno Sahid, who had met Raymond and officials from POIC Sabah Sdn Bhd at the Indonesian Consulate here recently. "We can also try to tap our neighbour Brunei's financial resources to make oil palm a truly BIMP-EAGA business," Tan said in his briefing on investment opportunities in Sabah, with special focus on the oil palm sector. He said that Borneo, including Sarawak, will become increasingly important globally because much of the world's future palm oil supply will be of Borneo origin. Indonesia is the biggest palm oil producer in the world, accounting for 45 per cent of global production. Malaysia is a close second with 44 per cent. Increasingly, Indonesia's new oil palm plantations will be in the Kalimantan provinces of East, West, South and Central Kalimantan. These provinces are expected in the next decade to have some five million hectares of oil palm. Malaysia had about 4.5 million ha of oil palm in 2008, of which 1.3 million were in Sabah, which is Malaysia's top palm oil-producing state. Tan said the palm oil industrial cluster in Lahad Datu (POIC Lahad Datu) was conceptualised with an intention to source vegetable oils (palm oil and coconut oil) in the BIMP-EAGA territories for value-adding at Lahad Datu. The key rationale is the existence of a natural deep-water harbour of over 20 metres than can accommodate ocean-going tankers and container-carriers of over 100,000 dead weight tons. Most harbours in the BIMP-EAGA region are not deep enough for larger capacity vessels which provide for economy of scale and savings on shipping cost. Meanwhile, Sahid said the oil palm sector can become the common denominator for Sabah and Kalimantan to work to fulfill the objectives of BIMP-EAGA as a sub-region of growth in Asean. He invited Sabah government officials and businessmen to visit the Kalimantan provinces to explore the development of bilateral investment. MPOC promotes the market expansion of Malaysian palm oil and its products by enhancing the image of palm oil and creating better acceptance of palm oil through awareness of various technological and economic advantages (techno-economic advantages) and environmental sustainability. MPOB is the premier, Nobel laureate-producing research and development institution providing leadership and impetus for the development of a highly diversified, value-added, globally competitive and sustainable oil palm industry. The Board enhance the well-being of the Malaysian oil palm industry through research, development and excellent services. DXN Holdings Bhd is buying 240ha of 99-year leasehold land in Lahad Datu, Sabah, for RM10.45 million for its biodiesel venture. DXN said on Nov 6 2006 that its unit DXN Oleochemicals Sdn Bhd the land from POIC Sabah Sdn Bhd. for building a biodiesel plant and processing of oleo chemical products and refinery. DXN Holdings Bhd expected the venture to contribute positively to the financial performance of DXN Group once it commences the operation activities. DXN Oleochemicals Sdn Bhd is a subsidiary of DXN Holdings Bhd, a listed company on the Main Board of Bursa Malaysia. DXN group has 21 subsidiaries and one associate company. Biodiesel is a new clean burning fuel produced from renewable resources, e.g. vegetable oil. Biodiesel contains no petroleum but blended at any level with petroleum diesel to create biodiesel blend. It can be used in compression-ignition diesel engines which require no modifications. Biodiesel is simple to use, biodegradable, nontoxic and essentially free of sulfur. 2) glycerin (a valuable by-product usually sold to be used in soaps and other products). Biodiesel is better for the environment because it is made from renewable resources and has lower emissions compared to petroleum diesel. It is less toxic than table salt and biodegrades as fast as sugar. The company's project in POIC Lahad Datu is an expansion from its Kuantan (Pahang) project under DXN Biofuels Sdn Bhd. This Kuantan project has an initial capacity of 200,000 metric tones per annum and is expected to start operation in October 2007. It will be expanded to double its annual production in the following year. At POIC Lahad Datu, DXN Oleochemicals Sdn Bhd's plan is to put up two biodiesel plants with annual capacity of 400,000 MT and 500,000 MT respectively. The first-phase production is estimated to be 200,000 MT per year. DXN Oleochemicals' projects in POIC Lahad Datu is estimated to cost USD127 million. Combined with its Kuantan facilities, the DXN Group expects to be one of the largest biodiesel producers in the Asian region in the next four years with an annual capacity of 800,000MT. DXN expects to exports its biodiesel to Germany and the United States. Plans are afoot to acquire land in Germany to build a tank farm to store and distribute Malaysian-made biodiesel. DXN Biofuels Sdn. Bhd and DXN Oleochemicals Sdn. Bhd are the subsidiaries of DXN Holdings Bhd principal activities in production and trading of methyl ester (biodiesel). An agreement on the purchase of 19.86 acres of land at POIC Lahad Datu was signed in Singapore 3rd August 2010 between POIC Sabah Sdn Bhd and Mewah Oils Sdn Bhd. Mewah Group, a Singapore company with refineries in Malaysia, is investing RM150 million to set up a 900,000 metric tons per year palm oil refinery at the palm oil industrial cluster in Lahad Datu (POIC Lahad Datu). The refinery will be the biggest in Sabah and create about 200 jobs. Mewah group's turnover is around US$2 billion and its existing refineries (in Peninsular Malaysia) have a combined output of 2.5 million metric tons per year. Mewah will also become the second company to set up refinery at POIC Lahad Datu, which to date has attracted about 30 companies with total investment exceeding RM2 billion. The other refinery belongs to Zurex Corporation, a company with British interests. Zurex's 200,000 ton-per-year refinery is due to start operation in 2012. The uniqueness of the two refineries in POIC is that their owners do not own oil palm plantations, and they are granted refinery licenses by federal authorities to operate exclusively in POIC Lahad Datu. Investors are attracted to POIC Lahad Datu as its located near to the raw materials, has a liquid oil jetty and a natural deep harbor with draft of over 20 meters capable of accommodating vessels up to 100,000 deadweight tons. Sabah is Malaysia's biggest palm oil with 10 palm oil refineries. Investments in the Palm Oil Industrial Cluster (POIC) in Lahad Datu has hit RM4.5 billion. As of July, 2012, 41 companies had invested in the Phase One and Phase Two of the industrial area, covering 459.71 acres. 7) supporting services, Tan said in reply to a question from Jimmy Wong (DAP-Sri Tanjung) during the question and answer session at the Sabah State Assembly here yesterday. The response from both domestic and foreign investors towards the POIC industrial area had been highly encouraging. On the progress of the site development, from the investments of the 41 companies, 11 units of factories or godowns had already been completed to an estimated investment amount of RM550 million. These had successfully created 323 employment opportunities. Most of these jobs had been taken up by the locals from Sabah including from Lahad Datu. 10 investors were in the process of constructing their project sites while another five were in the planning stages. Since 1980s, the Malaysian palm oil industry’s stronghold has been in upstream activities, where domestic fresh fruit bunch (FFB) production achieved higher yields or production per acre compared with other producers globally. Currently, Malaysia’s palm oil industry is the fourth largest contributor to the national coffers, accounting for at least eight per cent Gross National Income (GNI) per capita. The commodities sector was mostly driven by the private sector, with the government having a strong presence through its government-linked companies (GLCs). In Malaysia, 71 per cent of total agricultural land was used by oil palm plantations. 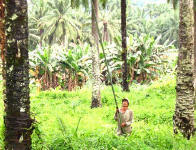 As of 2009, the total planted area for oil palm estates stood at 4.7 million hectares. “Growth is estimated at more than seven per cent in the next ten years, driven by FFB yield, expansion overseas and downstream activities. In terms of export, Malaysia boasts strong local production of palm oil, which contributed 37 per cent of palm oil production globally. In recent years, the world has witnessed a strong entrance by Indonesia. Despite domestic problems, Indonesia has emerged as a significant exporter and aggressive competitor in all palm oil markets, especially the production of FFB. In ensuring the sustainability of palm oil, organizations at a global level aspire to transform the markets to make sustainable palm oil the norm. At the national level Malaysia Palm Oil Board (MPOB), the Malaysian Palm Oil Association (MPOA) and the Malaysian Palm Oil Council (MPOC) are collaborating to set structures and standards for the local industry. In addition, MPOB also drives initiatives through research and development to introduce higher quality seeds and seedlings for local plantation usage. 3) decreasing height of the oil palm trees for easier harvesting. The land exploration for palm oil in Malaysia is increasing rapidly. In 2010, the total planted area was 4.8 million hectares compared with 2.02 million hectares ten years ago. 29 % in Sabah where 61 per cent ownership is by private corporations. Lack of available land is a major concern for the upstream industries. As a result, major players in Malaysia have started to focus on downstream activities such as production of downstream oil products, product packaging and global distribution. Export value for palm oil products increased to RM59.79 billion in 2010 in comparison with RM49.66 billion in 2009. The future roadmap for the palm oil sector was set to move even further with the implementation of Economic Transformation Programme’s (ETP) Entry Point Projects (EPP) for palm oil, where financial support are made available for industry players. National monitoring unit Performance Management and Delivery Unit (Pemandu) has outlined an action plan to clear a backlog of over 300,000 hectares of palm trees aged over 25 years. On the technology advancement perspective, there are only 12 mills currently, in Malaysia that embarked on the development of biogas plants and Pemandu had recommended that 500 additional mills to be developed by the year 2021. In line with the effort to move investing focus to the downstream sector, the emphasis on shifting national production from basic oleochemicals to high-value oleo derivatives is in action. One of the biggest concerns in the industry right now was the move to revise crude palm oil (CPO) export tax which remain unchanged since the 1960s. Although the changed was expected to take place by year-end or early 2013, there were no official announcement from the government as yet. Indonesia has overtaken Malaysia’s influence in shaping the direction of the global palm oil market. Currently, Indonesia imposes 19.5 per cent export tax for CPO, while Malaysia’s is 30 per cent after a duty-free limit of 3.6 million tones, putting it in a disadvantage position. Besides this, Indonesia refiners are also getting cheaper CPO and feedstock. Malaysia, being the world’s second-largest palm oil producer needs to reform the industry’s tax structure to counter new rates in Indonesia. On the other hand, HwangDBS Investment Bank Bhd (HwangDBS) in its latest report said palm oil processors in Indonesia were expected to consume more of their home-grown commodity in the third quarter and this would progressively deplete inventories. By end of 2013 The Palm Oil Industrial Cluster (POIC) in Lahad Datu has generated total investments of about RM2.21 billion to date. The light industrial warehouse at PortCity@POIC is a RM55 million project developed by BriSteel Properties Sdn Bhd. PortCity@POIC is strategically located within POIC along the busy Tengah Nipah Road to Felda Sahabat and only 2.3km from Lahad Datu. The light industrial warehouse is constructed with modern concept, contemporary design with wide open spaces, ample hardscape and more parking spaces. The offering of light industrial warehouses is timely and appropriate intime to cater the increasing demand in Lahad Datu. Sabah government identified POIC Lahad Datu as one of the five oleo hubs to promote the production of high-value derivative products in order to triple contribution of the oil palm sector to the gross national income.